I was approached by WOW toys recently asking whether Isla would like to try something from their site, the recommendation was a bath toy called Danny's Diving Adventure but we could choose anything. I went with the recommendation and I'm glad I did - Danny is fab and has changed bath times for Isla and made it more fun! Her bath toys up till now were water squirters and water mill type things and they all get grubby when they fill up with water. Bath time is always really noisy, fun and exceptionally wet in our house and this toy has definitely increased the fun factor. 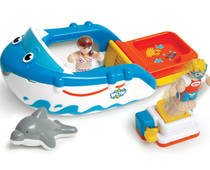 Danny's Diving Adventure is a 5 piece bath toy consisting of Danny (the boat), the diving board, Chris and Mandy and Daphne the Dolphin. The boat is really cool, as it folds out and has a diving platform that you can dive Chris and Mandy off from. Isla just calls them 'Man' and 'lady' and during her bath time role play, man and lady like to have a kiss now and then, do a bit of diving and using a sieve that we already had, they take showers. She also likes it when the boat is sinking (she's going to love the film Titanic......), and the man and lady also dive off the side of the bath! There is so much imaginative fun to be had with this toy and Isla is really good at making up stories. I loved so much about this toy - the packaging lists all the development benefits on the outside, the toy itself feels really sturdy and durable and there are no small parts to worry about swallowing or losing. It's really bright and visually appealing and I can't see Isla tiring of playing with it. Finally the best thing about WOW toys is that they don't need batteries which is good news. The only thing that I could say I found a bit frustrating was how difficult it was to get out of the packaging, as with all toys these days there were lots of plastic ties and fiddly bits to unhook the toy from the box and when you have an impatient 2 year old jumping up and down in front of you itching to get her hands on her new toy it can feel like an age trying to get it out! But this is a small niggle and as I said is the case with all toys nowadays. I'm definitely going to be checking out WOW before Christmas to pick up some pressies as I think they represent good value for money and will become favourite toys for many a pre-schooler! And once Isla is done playing with Danny I'm sure he will become a firm favourite with Noah. WOW toys can be purchased from John Lewis, Amazon, Argos and Tesco Direct to name a few of the big stores. Danny's Diving Adventure retails at £10.99 on Amazon at the moment. To write this post we were sent a WOW bath toy free of charge. The opinions stated in this post are honest and my own. I just purchased Danny's Diving Adventure for my granddaughter, who is spending the weekend with me. I thought it looked really cute and liked the idea of no batteries. However, it took me 1/2 hour to open the package, and when I finally cut the wire from the package, the piece that is the diving pad for the swimmer would not release, so the wire is protruding from the toy. I cannot give this to my 15mo old grandchild the way it is. I hesitate to take it back because I demolished the packaging in order to open it. I don't think I'll buy your product again. that's a real shame that happened. I did mention in my post about the packaging as it did irk me too. I don't think you should hesitate to take it back - you didnt purchase packaging - you purchased a toy and you clearly can't use it. If you do get a replacement and you get it out of the packaging it is a really good toy.